The Karakoram Splitboard Bindings reflects the attitude of “no compromise” when it comes to the splitboard. This philosophy believes that regardless of the split, the board should ride like a solid snowboard. These bindings firmly join your split board together while honoring the natural flex underfoot that guarantees that perfect riding performance. The Karakoram Bindings technology honors the airflow design for optimized strength to weight ratio. 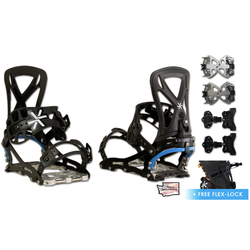 This binding is designed specifically for splitboard with power strap slits and medium flex. These bindings have a quick quarter turn from ride to walk mode. These bindings cover a range of specifications from heel lever, ride stride forward lean to open binding chassis – these specifications provide the best in splitboard technology. The Karakoram SL Splitboard Binding offers a change to carrying that extra weight that slows you down when snowboarding. The SL is made with Carbon Fiber, Titanium and high strength Aluminum alloy and DuPont Zytel thereby offering a binding that is lighter than its predecessor. This light and durable binding can stand up to anything that has been encountered in the backcountry; it is worth the investment and represents the next step in splitboard technology. 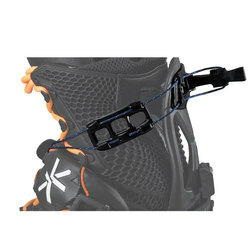 In addition to the bindings, the splitboard technology would not go very far without the Karakoram Splitboard clips that optimize the performance of the splitboard. 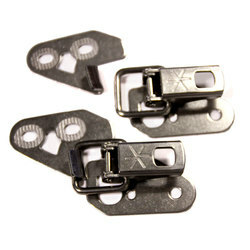 These clips firmly secure the splitboard halves together in such a way as to eliminate slop in the seam. 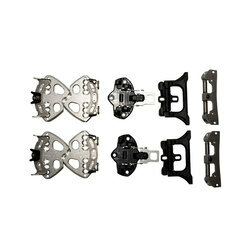 The Karakoram clips are a sure way of saying so long to tip and tail rattling once and for all. The engineering brilliance of Karakoram has manifested through these clips thereby providing a normal snowboard ride in all conditions. This is an example of the splitboard revolution, a seamless experience in riding the mountain in a perfected brilliance. The Karakoram team has worked hard to provide the best in splitboard binding and clip technology. Backcountry enthusiasts who simply wanted the best from their gear started Karakoram. This is the crucial to Karakoram; it is a team that, unlike the big ski industry, is there to listen. They want feedback on their products, and are sensitive to your experience.